The first step is to define our canvas and add some css that will set the size of the canvas to the size of the browser window. The next step is to create a folder named “scripts” and within it create a text file called grid.js using your favorite editor. The grid.js script will be responsible for all of the canvas updating. For starters, we will need to define the callbacks for window events in order to initialize the canvas data. “window.onresize” will be used so that the canvas can be cleared when the window is resized. At this point, the canvas is created, but isn’t very interesting. To draw on the canvas, we will rely on mouse events. In this demo, holding down the left mouse button and dragging will fill in cells of the grid that the mouse is hovering over. Holding any other mouse button down and dragging will be used for an “erase” function. It’s not actually erasing, but coloring the cells in with the defined background color. The following should be added to the window event callback defined above. Loading the page now should result in a functional drawing application. Changing the “penWeight” variable will alter the cell sizes on the hidden grid. As a small optimization, you may consider storing the last cell that was drawn to and skipping a redraw (included in the source example) if the user is still moving with the cell. At smaller cell sizes, this becomes less important. The demo for the grid can be found here. Blocking of the UI thread in a WPF application causes the application to become unresponsive. It is a common problem with several solutions, but usage of Task is in my opinion the most elegant solution because of readability and code brevity. For this example we have a simple WPF application with a button that starts a long running loop. A busy indicator is displayed while the loop is running. As written, this code will freeze the app for the duration of the loop since it blocks execution of the UI thread. The solution is to run the loop Asynchronously and using Task is the easiest way to accomplish it in this case. However, this bit of code will crash the application because we have not passed control back to the context of the UI thread. The ‘Task.ContinueWith’ method can be used to serve that purpose. Running the application will now result in complete responsiveness. You can move, resize, or perform other operations while the loop is running. However, there are cases where CPU intensive loops may cause the busy indicator to not be displayed. In WPF, the UI render events are queued to prevent issues related to multiple execution of the same event. To prevent this, we want to make sure that the busy indicator is displayed. And for that we can use a timer event. So, when the user clicks the button, the busy indicator is set to true first, the timer is started, and once it has ticked the Task is called. Using the timer event in this manner ensures that the loop will not be executed until the busy indicator is rendered. The complete source code for this example can be found in our github repository. Linear regression is a way to determine close two number series of data: x (independent) and y (potentially dependent), fit in a linear function of the form: y = a*x + b. This is the first of a series of planned posts that will cover how to set up linear regression a variety of different languages. 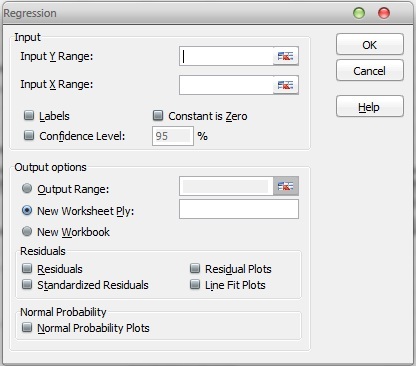 This week, we will discuss the easiest method of performing Linear regression analysis; and that is with Excel 2010. 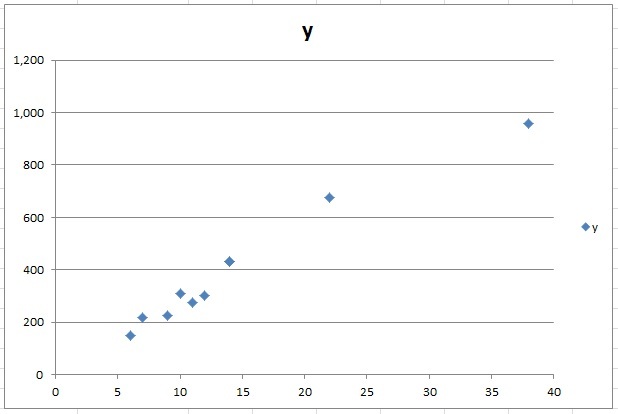 And there you have it; Linear Regression done simply in Excel 2010. 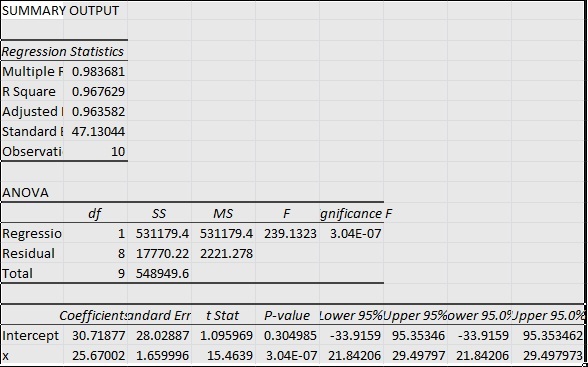 You should notice that the formula given uses the values obtained in the Summary Output of the Data Analysis step. Next week, we will discuss how to perform Regression analysis programmatically in C#.